Another flash-back to a month or two ago in which footnotes are footnoted. After a delightful 6 hour sojourn at the Oudomxay bus station, we managed to haggle our way onto a Vientiane bound bus that would drop us at some middle-of-nowhere intersection from where we were assured we could wrangle a tuk-tuk to Nong Khiew. This situation arose despite the board at the bus station showing no less than 6 daily departures direct to Nong Khiew, one of which we even managed to purchase a ticket for at one point (see point 3 here). I mostly dealt with this wait and the ensuing 7 hours or so of bus by gorging on bamboo tubes packed full of sweet, purple, sticky rice (one of the world’s great somnambulants). 3. watch the river go by. So that’s what we did. We may have stayed for days if it weren’t for a Dengue fever scare which sent us scuttling back toward civilisation the next day. 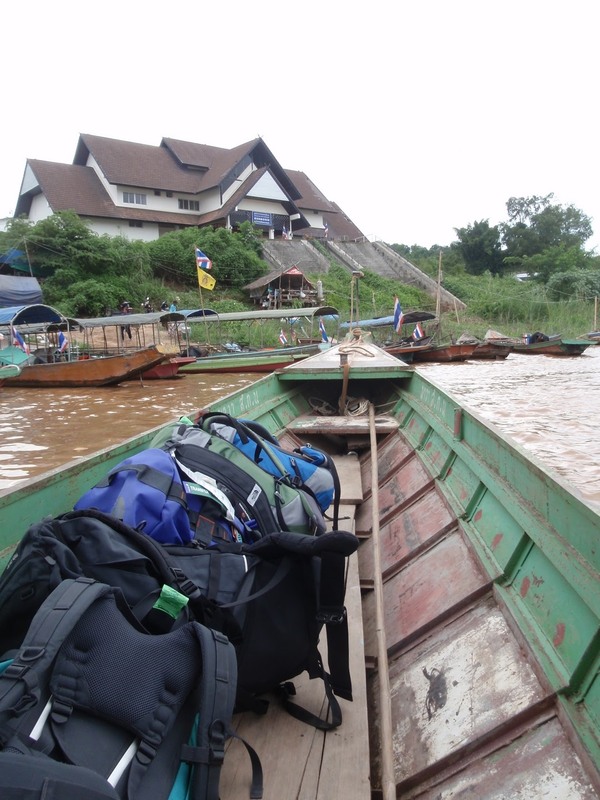 The plan was to do this by boat, heading down to Luang Prabang along the heavily swollen Nam Ou river. Laos being Laos of course, the boat wasn’t running that day so we ended up chartering a mini-van with a bunch of other stranded travellers. It was not nearly as scenic as I’m sure the boat would have been, but on the upside it cost less, was indescribably more comfortable and only took half the time. ** Plus those magic words “air conditioning”. So I’m calling that a win. *** On a single lane, partially sealed road, around each blind-corner of which frolicked errant children and livestock. 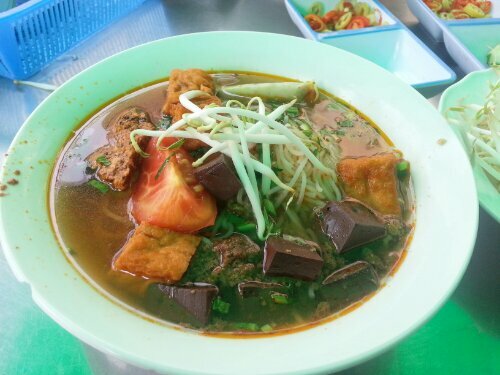 This particular delicacy was obtained at a small stall a couple hundred meters from Saigon’s museum of the American War. Of the dozen or so ingredients, I can confirm that the brown cubes are jellied blood, there’s some tomatoes, definitely a sprout or two and the rest is mystery meat paste and other miscellaneous edibles. Sarah didnt finish hers. Paired with a warm coke and costing about a dollar, I rate this three blood cubes out of a possible what the hell is that. 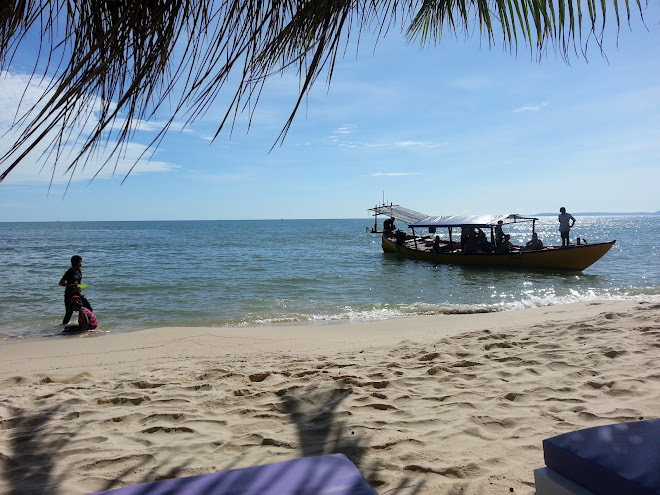 So I’m now about 2 countries behind on this thing, and lacking the time and inclination really to catch up (sitting in an internet cafe when it’s 30 degrees outside and I can hear the waves lapping on the beach feels suspiciously like work). This was never supposed to be a traditional “we went there then we did that” travel diary and it’s sort of turning into one so I’m gonna change things up a little, appeal more to the contemporary attention span (chiefly mine) by posting shorter, less chronological and hopefully more regular bits and pieces, not necessarily anything to do with what we did or where we went or anything at all in particular. For those still interested in the more traditional format, I’ll post a list of the cities we’ve visited/will visit and you can check out the Wikipedia page and any number of other travel blogs which are most likely better written/more interesting than this one. That said I have a few posts in draft form that I’ll probably bang up in the next couple o’ days, hopefully rounding out Laos at least. 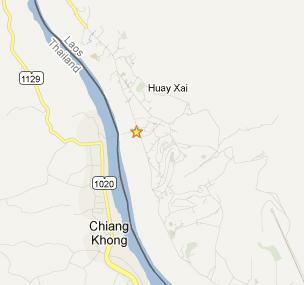 Whatever you want to call it, this is where we made landfall in Laos after our first (of many) crossings of the Mekong. - Try and forget the three Thai words you learned and use that memory space to pack in three Laos words. 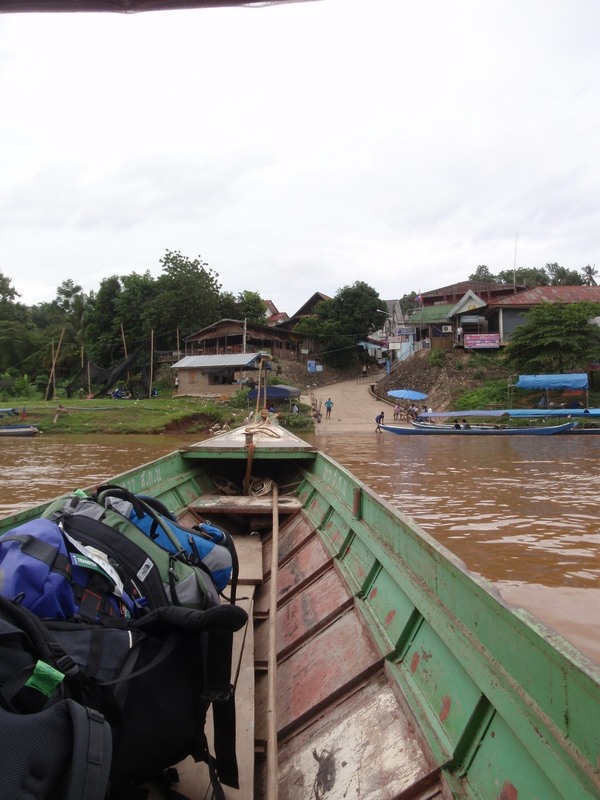 Most people head on to Luang Prabang from here, via the slow boat. We opted for the slow bus instead, north to Luang Namtha. 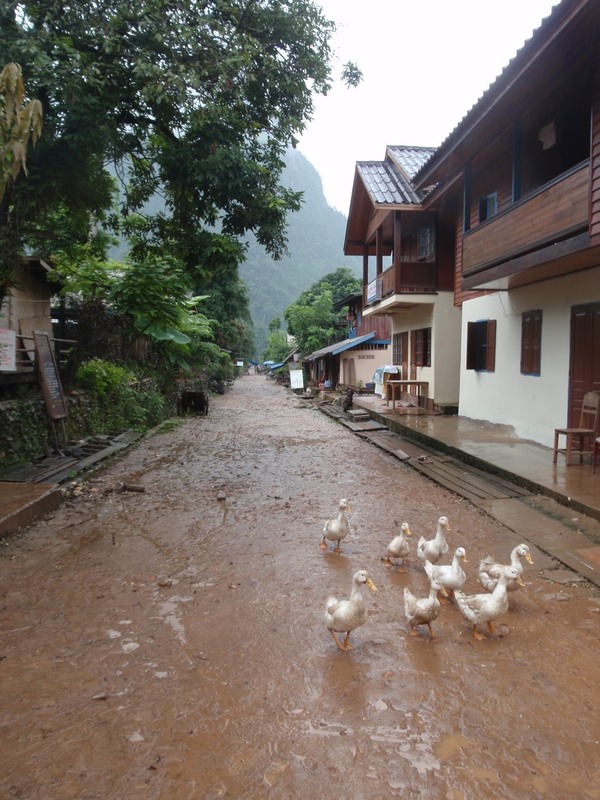 And that’s about it for Huay Xai (or Houay Sai or…). Don’t worry, Laos gets better. Then worse. Then better again. The downside of this is the frequent cancellation of plans, particularly those taking place on a river – kayaking, boat trips, &c. Our first attempt at booking a kayaking trip was cancelled not because the river level made the river too fast/rough, but because the water level meant that there wasn’t enough room between the river surface and the tree-tops to maneuver a kayak through. This was reported to us by a fairly tired looking fellow who later told us that he’d been up since 3 am evacuating a riverside guesthouse that had become signicantly less ‘side’ and significantly more ‘river’ overnight. * to be defined in full later. For now, use your imagination. ** Though you do start to run out of superlatives for ‘green’. Here’s a map of the places we’ve been so far (maybe, if it works). Obviously a work in progress, one day I might fix the colour coding by mode of transport, dates, more pithy comments etc. Annoyingly, Google maps lists the various lines, markers etc as ‘results’ so you only get so many per page before you have to hit ‘next’ at the bottom to see the rest (like Google results ja?). First page is roughly NZ to Luang Namtha (Laos). Page 2 gets you to Cambodia. Being mostly a list of petty annoyances that have festered inside me on account of the general non-confrontational nature of New Zealanders. 1. Dark Beer Lao is better than normal Beer Lao (which is still pretty good). It is also stronger (6.5%) beware. 2. If you are taking a local bus, you do not have an assigned seat. I don’t care what your ticket says or what long-faded number may once have been sharpied onto the vinyl of that seat. Your ‘reservation’ is your arse. Put it in a seat and wait til the bus leaves. We aren’t going anywhere until you sit down and complaining to the woman in the ticket booth isn’t going to get anyone anywhere so please just shut up. You know who you are. 2a. Your bag does not have a seat on the bus. If it’s bigger than a handbag, it goes on the roof. Don’t worry, they’ll cover it and tie it down. “But what about that spot in the aisle” you say? That isn’t an aisle. That is where another row of plastic stools will go. “How about under my feet?” Take a look. There are already three sacks of rice there. “But what about…” No. If there is a flat surface within the vehicle, 1 or more people will soon be sitting on it. 2b. None of the above applies on the significantly more expensive VIP busses. Get the hell out of my seat. 3. The bus timetable is a work of fiction. Any resemblance to bus services living or dead is entirely coincidental. The bus will go when the driver is good and ready. If at all. This is doubly true in the off-season. 4. There is no correlation between the distance of a journey and its duration. 100km can easily take 6 hours. Any estimate of time you are given should be taken with a 2 hour margin of error either way. This still applies to journeys of less than 2 hours. 4a. “Road quality” is strongly correlated to “distance from things the Chinese want”. This is why you can be cruising along a broad, smooth, well marked highway on your way to a village of 200 people one day, and having your internal organs rattled out on a muddy trail on your way between the two largest cities in the country the next. 5. Getting mad/frustrated at any of the above will get you nowhere, except maybe further from your goal. I watched a Lao official take a full 5 minutes to write the date on a form, I suspect just to see if he could make the increasingly frustrated falang he was dealing with actually explode. It was a close thing. 6. Where and whenever you can, hire a bike and peddle about. 7. The tubing scene in Vang Vieng is the domain of boorish, indecent, priviliged westerners; it is destroying the local way of life, the stunning beauty of the surrounds and encouraging petty thievery and drug use amongst local children. That said you’ll probably still do it and have a ball (and get pink-eye). We hired bikes and peddled about and got to enjoy feeling morally superior AND awed by the surrounds. 10. And please – do not pronounce the S. I will fight you. * this one is controversial amongst my fellow travelling folk and may be expanded upon at a later date. ** well you might. But you’ll die happy and greasy. 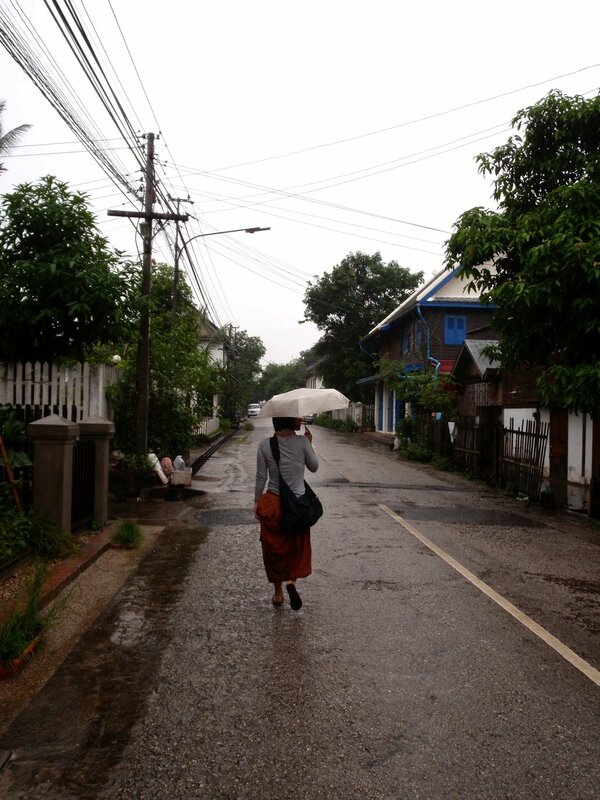 Before moving on to parts Laotian, allow me to expand a bit on our trip (almost) to Burma. 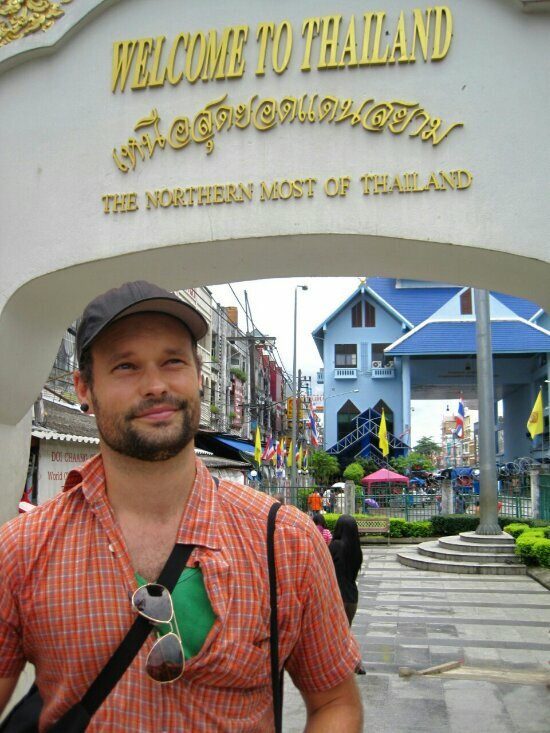 About 2 hours drive (~50km) north of Chiang Rai you’ll find what is known as the Golden Triangle. Named for the being the intersection of Thailand, Burma and Laos and probably for the large amounts of profit made in the areas by heroin traffickers over the last century or so. Having a weekend off from our brick-making duties, we decided to pop up and see what it was all about. The plan was to pop on Friday afternoon, check into our hotel, see the Friday night market, then get up early Saturday, pop over the border in the morning and tootle about on motorcycles in the afternoon, perhaps popping over to see the nearby Chinese town or some cavey/buddha-ish type stuff. Pretty much none of this happened. Before even reaching Chiang Rai from the foundation, we realised we’d forgotten our passports. Not wanting to miss the bus we scratched the idea of entering Burma, figuring we’d just admire it from afar (spoiler: it turned out to neither be that admirable or that far). Next hitch was finding the hotel. Trusting Google maps to see me straight, I leapt off our tuk-tuk within spitting distance of the pulsing blue dot that indicated it was. In theory. 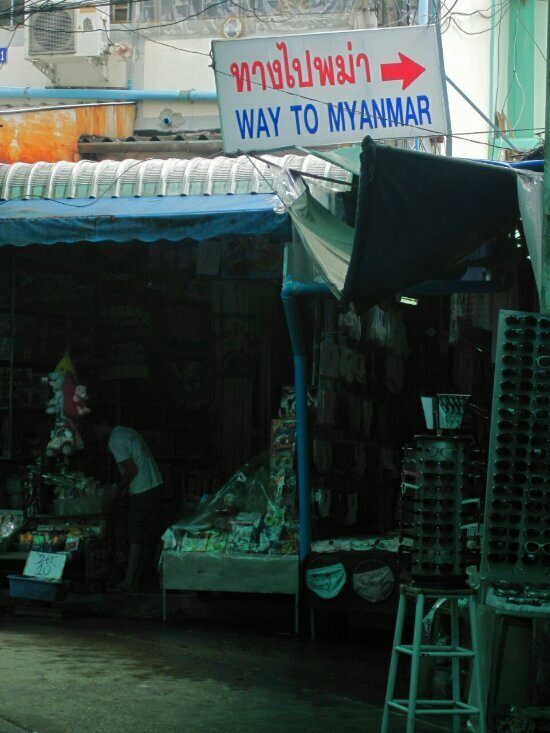 In fact our hotel was about 2km further down the road* (fortunately Mae Sai is almost literally a single road). A soggy hour and some terse conversations about my reliance on technology later, we found the Piaporn hill hotel (not to be confused with the Piaporn Hotel, or the Piaporn Inn, both within a 100m radius), dumped our bags and headed out into the rainy dark to discover that they’d cancelled the night market on account of the weather. So scratch that. We settled for grabbing something to eat from a roadside stall, hunting for one with a recognisable dish or at least a picture, eventually zeroing in on a place that looked to be making Khao Soy. We did our best Khao Soy impression, reached some kind of agreement with the cook and went to sit down. Not entirely sure that we’d made our order clear, we were at least confident that whatever arrived would be a welcome change from our previous week’s diet of rice and stir-fried vegetables. I think you can see where this is going. It was tasty all the same. The next morning saw a continuation of the rain theme, and an accompanying reluctance to head out on motor bikes. Instead we took a stroll through the markets, resplendent with the latest and greatest in Chinese knock-offs, fresh from over the border. We did actually manage to find a passable Khao Soy. Eventually we wound up at the border itself (probably 200m from our hotel as the crow flies, about 2km via the labyrinthine markets). Given the Burmese junta’s reputation for being a secretive dictatorship, ruling over a closed country with an iron fist, I was expecting something along the lines of barbed wire and guns and stern looking men in uniform scowling at orderly rows of prospective visitors. The actual scene is a lot more informal. You stroll up to one gate, pay your money, get your stamp and walk about 30m across the Mae Sai river. At the other end – another payment, another stamp and you’re in. Granted you aren’t supposed to leave that town, Tachileik, and by all accounts it’s more or less exactly the same as the Thai side (but more so) but you are in Burma. When you’re done having fake Johnny Walker and fake Marlboro’s and fake Nike pitched at you, you turn around and reverse the process, with the customs agents on the Thai side theoretically scrutinising your luggage. 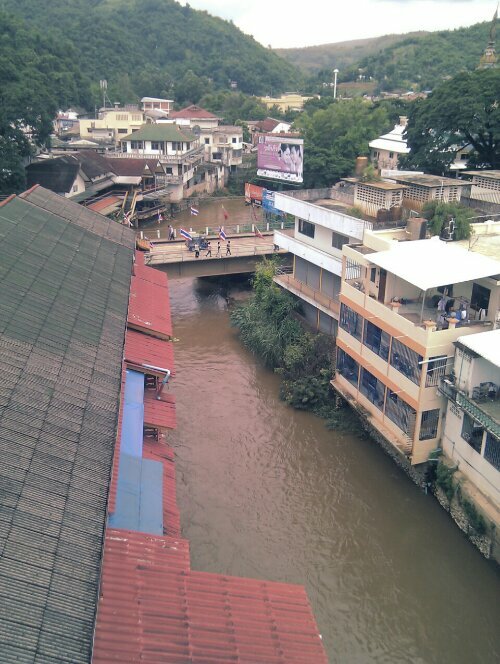 The picture is less of a tightly controlled border than of a market with a river down the middle, people streaming across each way for most of the day. About mid way along the bridge you’ll see children leaping into the swift Mae Sai, seemingly letting the current decide which country they’d hop out on. From the restaurant where we ate lunch I could’ve pelted several river facing burmese houses with eggs (should I have felt so inclined) and I throw in the style anachronistically known as ‘like a girl’. So yeah, Burma! You can go there if you want. There’s probably not much reason to. On the bus back to Chiang Rai we crossed several police check-points tasked with stopping the flow of illegal goods and workers into Thailand. This was accomplished by hopping on the bus, poking the nearest bag with a disinterested toe a few times, scanning the collected faces to make sure nobody looked too illegal, grunting and disembarking. In unrelated news, Thailand is awash with illegal Burmese workers and goods. *As an aside I have since had the folks at Google correct this and I demand recognition from you my readers for this selfless act, as nobody else will ever know. So now I’m only say, one month behind what we’re actually doing. ambisinistrous is powered by WordPress 3.9.27 and Theme Nameless.